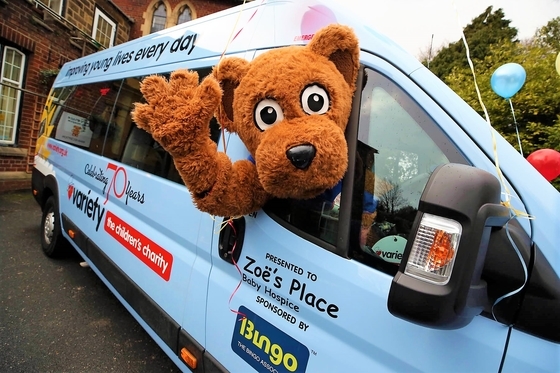 A Variety Sunshine Coach was presented by The Bingo Association Chief Executive, Miles Baron, and Anna Turley Member of Parliament (MP) for Redcar, to Zoe's Place Baby Hospice in Middlesbrough. The Sunshine Coach is the 25th to be donated by The Bingo Association since 2014. Zoe's Place Baby Hospice is a charity providing palliative, respite and end fo life care to babies and infants aged form birth to five years suffering from life-limiting or life-threatening conditions. The charity opened the first hospice in Liverpool in 1995. In 2004 a second Zoe's Place was opened in Middlesbrough and in 2011 the third opened in Coventry. The hospice in Middlesbrough provides respite care fro 35 babies and children, many of whom have highly complex genetic conditions and illnesses and require different levels of 24-hour support on a one to one basis. The new specially adapted Sunshine Coach will be regularly used by the nursing team to take children out for special days away from the hospice without the worry and cost of hiring buses. There are seven children whom must always travel in their wheelchairs. Also, their volunteer drivers can help the parents travel to and from the hospice and attend hospital visits with their children. Thanks to the fundraising efforts by staff and customers of bingo clubs like Beacon Bingo in Redcar, The Bingo Association have raised over £1.3 million in support of Variety, the Children's Charity and have agreed to extend their fundraising efforts for an additional year into 2019. "More than 350 bingo clubs across the UK, including the local bingo club her in Redcar, helped make this very worthy donation of a Sunshine Coach possible. I am especially pleased to be here with Anna Turley in her Redcar constituency, who has been such a great supporter of the bingo industry in her role as Chair of the All Party Parliamentary Group (APPG) fro Bingo since October 2016. We are delighted to have now raised over £1.3 million for Variety which has exceeded our expectations! Being able to enhance the lives of very young children at a hospice such as Zoe's Place has been so rewarding." "The generosity of The Bingo Association, and the clubs across the country, has directly touched the lives of many disadvantaged and disabled children around the UK. We are truly grateful for the Association's continued support and delighted that the organisation has agreed to donate this Sunshine Coach to Zoe's Place Hospice in Middlesbrough, in this our 70th year." "Zoe's Place is an amazing local charity who provide the most special gift of love, compassion and excellent care for families in realty heart-breaking circumstances. I know they work extremely hard to raise funds to continue their work and the bus will be a fantastic addition to the service they can offer the children and their families." "I would like to say a massive thank you to The Bingo Association, Variety and bingo players across the country whose generosity has delivered this gift. As Chair fo the All Party Group for Bingo in Parliament and a friend of Beacon Bingo in Redcar, I have seen first-hand how bingo clubs thrive on brilliant community spirit. Their charity work with Varieties a shining example of that and I am so grateful to them for helping out children in our area facing the shortest of lives."